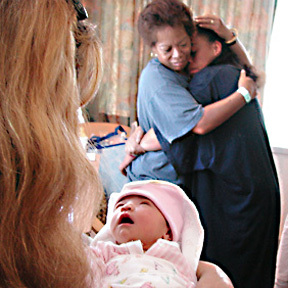 Debra Ahuna embraced her daughter, Serena, as nurses prepared to discharge newborn Shea from Kapiolani Medical Center. Serena was allowed to spend two nights and three days with her daughter before having to return to prison. Her mother agreed to take care of the baby until Serena was released.